Here, we present a protocol that allows the investigator to assess leukocyte recruitment dynamics ex vivo by connecting a chamber coated with endothelial-derived adhesion molecules to the circulatory system of a mouse. This method offers significant advantages since it allows for leukocyte assessment under relative biological conditions. Mulki, L., Sweigard, J. H., Connor, K. M. Assessing Leukocyte-endothelial Interactions Under Flow Conditions in an Ex Vivo Autoperfused Microflow Chamber Assay. J. Vis. Exp. (94), e52130, doi:10.3791/52130 (2014). Leukocyte-endothelial interactions are early and critical events in acute and chronic inflammation and can, when dysregulated, mediate tissue injury leading to permanent pathological damage. Existing conventional assays allow the analysis of leukocyte adhesion molecules only after the extraction of leukocytes from the blood. This requires the blood to undergo several steps before peripheral blood leukocytes (PBLs) can be ready for analysis, which in turn can stimulate PBLs influencing the research findings. The autoperfused micro flow chamber assay, however, allows scientists to study early leukocytes functional dysregulation using the systemic flow of a live mouse while having the freedom of manipulating a coated chamber. Through a disease model, the functional expression of leukocyte adhesion molecules can be assessed and quantified in a micro-glass chamber coated with immobilized endothelial adhesion molecules ex vivo. In this model, the blood flows between the right common carotid artery and left external jugular vein of a live mouse under anesthesia, allowing the interaction of native PBLs in the chamber. Real-time experimental analysis is achieved with the assistance of an intravital microscope as well as a Harvard Apparatus pressure device. The application of a flow regulator at the input point of the glass chamber allows comparable physiological flow conditions amongst the experiments. Leukocyte rolling velocity is the main outcome and is measured using the National Institutes of Health open-access software ImageJ. In summary, the autoperfused micro flow chamber assay provides an optimal physiological environment to study leukocytes endothelial interaction and allows researchers to draw accurate conclusions when studying inflammation. Inflammation is the body’s universal response to injury and is a crucial step in both innate and adaptive immune system function. In response to injury and/or inflammatory stimuli, endothelial cells upregulate specific adhesion molecules; this leads to leukocyte extravasation through the microvascular endothelium, primarily in post capillary venules. This process starts with tethering of the free-flowing leukocytes in the bloodstream on the endothelium. Stable rolling and firm adhesion of leukocytes, which in turn leads to transmigration and the secretion of cytotoxic agents, follow this tethering1,2. Selectins are known to mediate the early steps of the cascade3-5; integrins are responsible for the later steps of firm adhesion and transmigration1,6-8. A growing body of evidence suggests leukocytes and endothelial adhesion molecules have vital roles in animal models of ischemia reperfusion injury, asthma, psoriasis, multiple sclerosis, and age-related macular degeneration9-12. Under these conditions, the inflammatory response is misdirected to attack one’s own body, resulting in the breakdown of healthy tissue. Existing anti-inflammatory agents (such as non-steroidal anti-inflammatory drugs, corticosteroids, or other chemotherapeutic agents) carry the risk of severe side effects with long-term use13. Therefore, it is of great interest to have the appropriate tools with the ability to identify disease-specific molecules, which can ultimately be targeted to have the desired anti-inflammatory effect while remaining non-toxic14. Existing in vitro methods such as the static leukocyte adhesion assay were used as early as 197615. The parallel flow chamber was first used in vitro in 1987 to study leukocyte-endothelial interactions under flow conditions. In these experiments, stimulated human polymorphonuclear leukocytes (PMNs) from venous blood were perfused over a monolayer of primary human umbilical vein endothelial cells (HUVECs). To control for the hemodynamic flow conditions, the Harvard Apparatus syringe pump was employed16. Alternatively, to avoid artificial leukocytes isolation, whole blood was used in combination with the glass chamber coated with immobilized adhesion molecules17. To avoid leukocyte stimulation and to mechanistically study their interaction with the adhesion molecules under approximate physiologic conditions, an ex vivo autoperfused, extracorporal, arteriovenous circuit was developed16. In this circuit, the blood flows between the right common carotid artery and left external jugular vein of a live mouse under anesthesia, allowing interaction of native PBLs within a glass microflow chamber coated with single or co-immobilized adhesion molecules. A major advantage to this system is the ability to employ genetically engineered mice, in which inflammatory pathways are directly or indirectly manipulated. Additionally, there is the ability to pinpoint the isolated contribution of leukocyte adhesion molecules to inflammation, free of external activation, under flow conditions. The application of a flow regulator at the input point of the flow chamber provides a wide range of experimental variations of shear forces to mimic either arterial or venous systems18-22. Here we describe in great detail a protocol concerning the preparation and performance of the ex vivo autoperfused microflow chamber assay. All experiments on animals were handled in accordance with the Association for Research in Vision and Ophthalmology Statement for the Use of Animals in Ophthalmic and Vision Research, and the guidelines and regulations set forth by the Massachusetts Eye and Ear Infirmary Animal Care Committee. To prepare the jugular side, connect 1 cm PE10 polyethylene tubing to 6 cm silicon tubing followed by 5 cm polyethylene tubing. For the carotid side, prepare similarly to the jugular side with the addition of a T-tube within the 6 cm silicon tubing about 1.5 cm away from the 1 cm polyethylene tubing (Figure 1A, B). In order to insert the T-tube, widen the silicon tube by using fine forceps if necessary. Connect one end of 10 cm of silicone tubing to the pressure transducer then insert the T end of the carotid side T-tube into the other end. Ensure the connection sites are tight and leak free. Apply a small rectangular piece of parafilm over where the tubing fits together, if necessary, to prevent leakage (Figure 1C). Prepare the endothelial surface coating protein (e.g., P selectin, intercellular adhesion molecule-1 (ICAM-1), vascular cell adhesion protein-1 (VCAM-1)) in 0.1% BSA. As a guideline, 1 μg of protein in 200 μl BSA is enough to coat 4-5 chambers. Using a 1 ml syringe connected to a 25 G needle, infuse each chamber (0.04 x 0.4 x 50 mm) with endothelial surface coating protein. Store the coated chambers in a 15 ml tube at 4 °C overnight. Remove the coated chambers from 4 °C and connect the jugular and carotid tubing to each side. Seal the connections by carefully stretching a small rectangular piece of parafilm over where the tubing meets the chamber. Using a syringe, fill the chamber and tubing with 0.1% BSA (check for leakage). Incubate for 45 min. Prepare a 35 mm Petri dish to hold the chamber by cutting notches on each side of the dish. Stabilize the chamber in the notches; then use a small drop of silicone to affix the chamber to the dish at the notched site. Make sure the chamber is level by looking under the microscope. Allow the silicone to dry for at least 15 min. Fill a 60 ml locking syringe with heparin and connect to the pressure transducer. Connect the pressure transducer to the carotid tubing in the following order: Transducer, silicon tubing, and T-tube. Use a 1 cm PE50 between the silicon tubing connected to the transducer and the T-tube to secure the connection. Pass the carotid artery silicon tubing through the pressure clamp (Figure 1D). Run 100USP heparin through the tubing and chamber until there are no air bubbles. To prepare the software, turn on the computer, microscope, and open lab device. Double click on the Leica application suite (LAS) (or equivalent) and prepare a folder to save the video: browse → acquire → movie → define sequence of clips (clips = 15, recording time = 30 sec, and intervals = 15 sec) then click the “+” sign to confirm. To record the flow pressure open the LabChart (or equivalent) file and coordinate the file name to the recording folder in step 4.1, above. Anesthetize an 8-10 week-old mouse using a combination of ketamine (60 mg/kg) and xylazine (6 mg/kg) injected intra-peritoneally (IP). Confirm that deep sedation is achieved within 5-10 min by loss of pedal withdrawal reflex. If necessary, isoflurane delivered via face mask can be given as needed. While under anesthesia, place a warming pad under the cage and set to 37 °C to maintain body temperature. Once proper anesthesia is confirmed, place the mouse in a ventral position and coat the eyes with bacitracin ointment to prevent ocular dryness. Thereafter, shave the hair at the incision site using a razor blade and thoroughly clean the site with alcohol. Once fully anesthetized secure the animal with tape keeping the mouse in a ventral position. Expose the neck area with scissors and remove the thyroid gland to expose the trachea and vessels (Figure 2A). Clean the carotid artery until it is fully exposed taking care not to damage the vagus nerve (Figure 2B). Fold a piece of suture and pass the bend underneath the carotid artery then cut at the bend so there are now 2 pieces of suture underneath the carotid. Loop each suture into knots (do not tighten the knots). Repeat the same procedure to expose the left jugular vein (Figure 2C), preparing the sutures in the same manner (Figure 2D). Connect the tubing to the mouse vasculature. Heparinize the mouse by injecting 1 ml of heparin IP. Tighten the upper suture on the carotid artery. Place the vessel clamp as low as it can go on the carotid artery (Figure 3A). Use forceps to hold the artery by the upper suture and make a small incision, about 1/8 of the circumference of the artery, using the microscissors (Figure 3B). 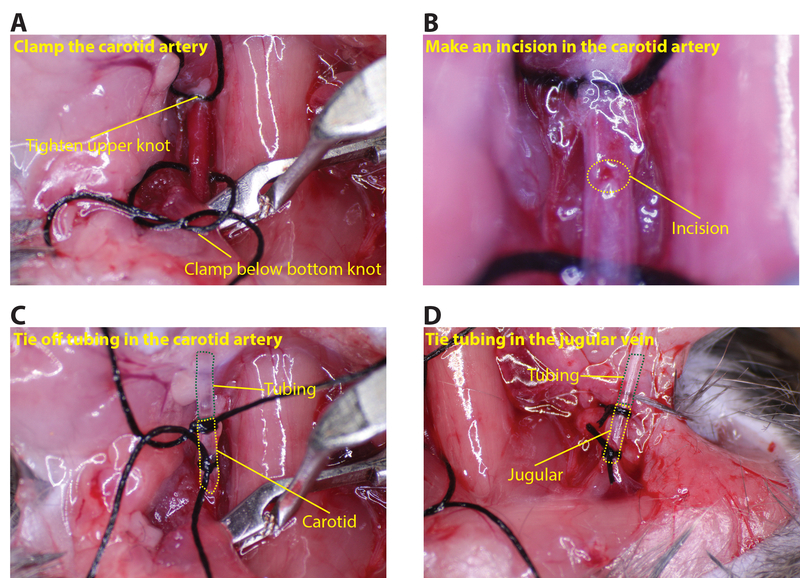 Pass the carotid artery tubing through the second knot in the upper suture and into the incision made in the artery. Tie off the lower suture so that the artery is sealed around the tubing (several knots should be made to ensure a tight seal; Figure 3C). Repeat the same procedure for inserting the jugular vein tubing (the vessel clamp is not needed for the jugular side; Figure 3D). Test the flow by releasing the vessel clamp. If there are no leaks move the mouse to the microscope and connect the carotid tubing and jugular vein to the chamber tubing (see attached video for demonstration of surgical procedure). Open the carotid clamp to fill the chamber, making a circuit with the mouse circulatory system. Allow the blood to circulate for 3-5 min so that the flow conditions stabilize. During the waiting period of 3-5 min, adjust the microscope stage so that the chamber is level from one end to the other with the microscope objective and its edge is parallel with the video recording window on the screen. Fill the modified Petri dish containing the glass chamber with water then lower the 10X water immersion objective into the dish so that the cells flowing through the chamber are visible. The light intensity may have to be adjusted for adequate viewing of the cells. Generally a lower intensity is better. Adjust the clamp on the tubing so that the transducer reads a steady 30 mm Hg, correlating to a medium physiological flow pressure, or as desired. Press “start” to initiate recording both the video and the pressure with the first time lapse close to the jugular end and moving against the flow toward the carotid end until completed. NOTE: Several coating conditions using different adhesion molecules can be studied in the same mouse by using multiple chambers. Only one chamber is recorded at a time. When recording is finished, close the valve at the input site, stopping the blood flow. Remove the chamber and fit a new chamber (coated with a different adhesion molecule) to the circuit using fine forceps in one hand and grooved forceps in the other hand. Resume recording for the new chamber as outlined in the steps 6.1-6.4. Euthanize all mice by CO2 asphyxiation followed by a spinal cord dislocation at the end of the experiment. The procedure is terminal, therefore, the mice are euthanized by a spinal cord dislocation at the end of the experiment. To analyze the recorded data use the “M TrackJ” plugin for ImageJ software23. Convert the file to grayscale by Select file → import → AVI → convert to grayscale. Standardize the frames by Select → image → property → enter the frame intervals (i) → global. Calculate the frame intervals by dividing the total video duration (usually 30 sec) by the number of frames in one video (shown in the upper corner of the Image J video window). Measure the flow of each leukocyte by Select plugin → M TrackJ → Add tracks → select a leukocyte → Track it with each frame for 15 - 20 sec → Merge. Repeat step 7.4 for all the leukocytes in view. Determine the mean rolling velocity of the leukocytes by Select measure → two columns appear → Copy all of the M TrakJ:Tracks into a spreadsheet. The column labeled “mean V” is the leukocyte rolling measured in pixels/second. Convert into μm/sec by dividing by 2/3. To analyze the pressure data highlight and export into a spreadsheet and perform the following calculation: ΔP (mm Hg) and t (dyne/cm2) for a comparison between each experimental group. Once calculated, copy the data into prism software for graphing. During each recording only interacting leukocytes are evident on the chamber. Results from a representative experiment can be seen in Figure 4. The white arrows point to individual leukocytes that were captured by the adhesion molecule of interest and are rolling along the chamber amongst other free-flowing ones within the blood flow. A common artifact outside the chamber can be seen with the large dark spheres in all the images. The dark spheres help the reader appreciate the leukocyte movement in relation to a fixed point. Leukocytes advancement over a period of 22 sec can be seen in relation to the spheres. The graph in the same figure shows a final plot of the data where Tx1 decreases the rolling velocity (a shift to the left) and Tx2 increases the velocity (a shift to the right) compared to the control. Figure 1: Preparation of tubing for the flow chamber. (A) Tools required for tubing and chamber assembly (micro glass chamber 0.4 x 0.04 x 50 mm, polyethylene tubing PE10, polyethylene tubing PE60, silicon tubing 002, Y tube, T tube, 35 mm Petri dish, fine forceps, fine scissors, tube holder, vascular clamp, 7-0 silk suture. 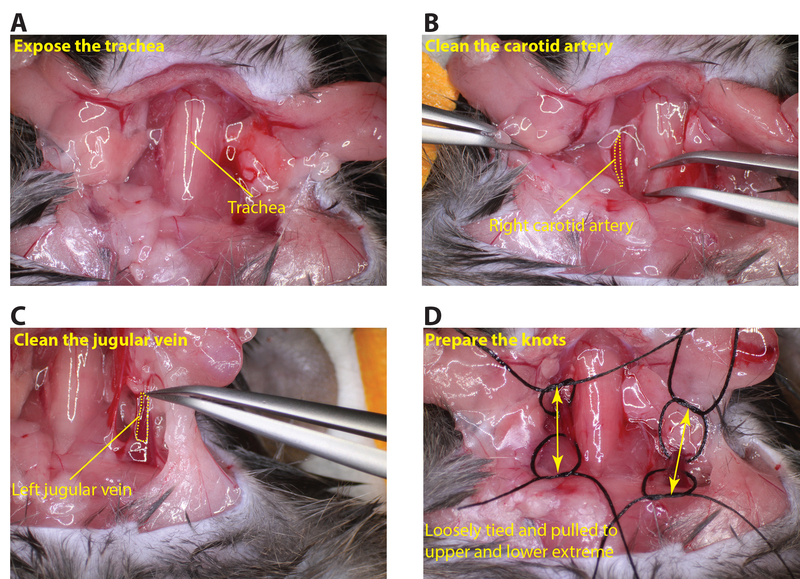 (B) Preparation of the carotid artery and jugular vein tubing for re-directing the mouse blood flow through the coated chamber. (C) Connecting the carotid artery tubing to the pressure transducer. (D) Pass the tubing from the transducer through the clamp to adjust the rate of the blood flow. Please click here to view a larger version of this figure. Figure 2: Exposing the carotid artery and jugular vein. (A) Carefully cut the neck area to expose the trachea. (B) Clean the right carotid artery so that a piece of suture can be passed underneath the vessel (dotted yellow line outlines the carotid artery). (C) Clean the left jugular vein so that a piece of suture can be passed under the vessel (dotted yellow line outlines the jugular vein). (D) Arrange loosely tied sutures at the upper and lower regions of the carotid artery and jugular vein (arrows indicated the upper and lower regions of the vessels). Please click here to view a larger version of this figure. Figure 3: Connecting the tubing to the carotid artery and jugular vein. (A) Tighten the upper knot on the carotid and place the clamp below the lower knot. (B) Using the microscissors, make a small incision in the carotid, about 1/8 the circumference (dotted yellow circle indicates the incision). (C) Insert the tubing into the carotid and secure with at least two sutures (green dotted line shows the tubing and the yellow dotted line the carotid artery). (D) Similarly insert tubing in the jugular (green dotted line shows the tubing and the yellow dotted line the jugular vein). Please click here to view a larger version of this figure. 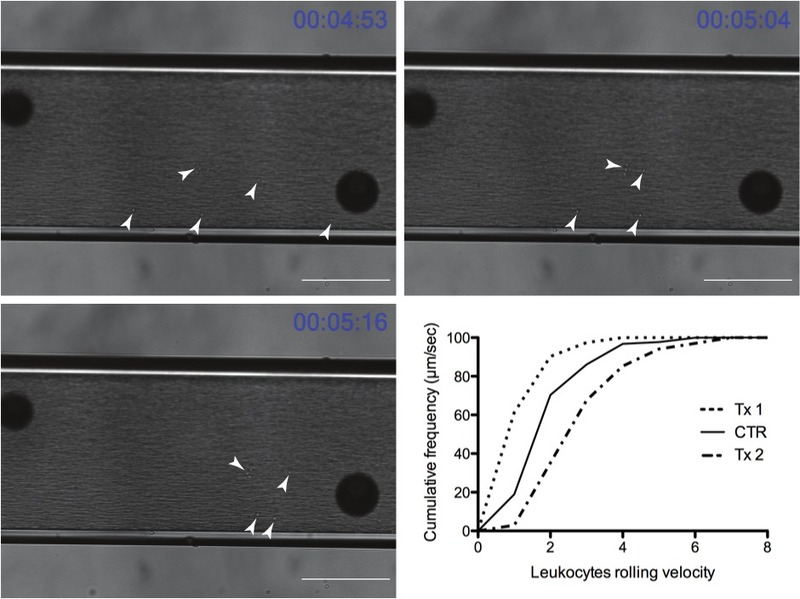 Figure 4: Representative time course of leukocytes rolling through the flow chamber (Scale bar = 100 μm) (white arrowheads point out rolling leukocytes). Graph depicts representative results after exporting into a graphing program (Tx1 and Tx2 are experimental treatment groups and CTR is the control group). Tx1 represents a treatment in which leukocytes slow down leading to a decrease in leukocytes rolling velocity and a left shift of the graph compared to the untreated group (CTR), while Tx2 leads to a right shift reflecting an increase in leukocytes rolling velocity. Please click here to view a larger version of this figure. The process of leukocyte recruitment is a crucial step in the inflammatory response; it involves the migration of leukocytes from the circulatory system towards target tissues, where they are able to exert their effector function. Leukocyte recruitment is integral in a variety of inflammatory conditions such as atherosclerotic plaques, myocardial infarction, ischemia/reperfusion, and transplant surgery1, as well as multiple CNS related neuro-inflammatory conditions10-12,20,24,25. Considering the diversity of the disease conditions that leukocyte recruitment spans, the autoperfused microflow chamber provides an indispensible tool allowing the investigator the ability to study leukocyte migration dynamics. Over the past several decades, a variety of in vitro assays have been developed to study the dynamics of leukocyte cell adhesion26. Unfortunately, all of these assays require the extraction of the leukocytes from the blood, introducing mechanical activation. To get closer to the in vivo environment, adaptations were made to collect whole blood samples and control the hemodynamic flow conditions16,17. Here, we extend the previous advances in the field by linking a coated chamber to the mouse circulatory system. We are able to regulate the flow of the blood to a physiologic range and study the dynamics of leukocyte rolling. The coated chamber gives us the ability to study leukocyte interactions with specific adhesion molecules. Since the system is functioning as a unit operated by a live mouse, it more closely mimics the natural environment, allowing us to study leukocyte-endothelial interactions in a variety of immunologic mouse models. Additionally, this system allows us to take advantage of the multiple genetic mouse models available. While the system does not completely replicate the in vivo environment, it provides a platform to study specific elements of the leukocytes under physiologic conditions, a feat that has not previously been possible. Even though this takes us a step closer to a more physiologic environment there are limitations to the system. It does not completely replicate the complex 3D matrix of the vasculature so we are only able to assess certain elements of leukocyte interactions that are restricted to the chamber coating. In addition, great care should be taken to ensure a closed system to the mouse circulation by following all the steps mentioned in the protocol. The introduction of air bubbles will greatly affect the accuracy and reproducibility of the experiments. While we describe the use of the Autoperfused Microflow chamber for assessing leukocyte rolling dynamics the procedure has the potential to be personalized by investigators to study a variety of diseases. For example, cancer cells metastasize by expressing many of the common integrins shared by leukocytes. Studying their rolling dynamics in a setting that more closely mimics an in vivo environment could help in our knowledge, and possibly the prediction, of the invasive nature of certain cancer cells. One possible approach could be to combine a labeling technique for the cancer cells, such as GFP27, along with the flow chamber assay to track rolling dynamics of the cancer cells expressing GFP. 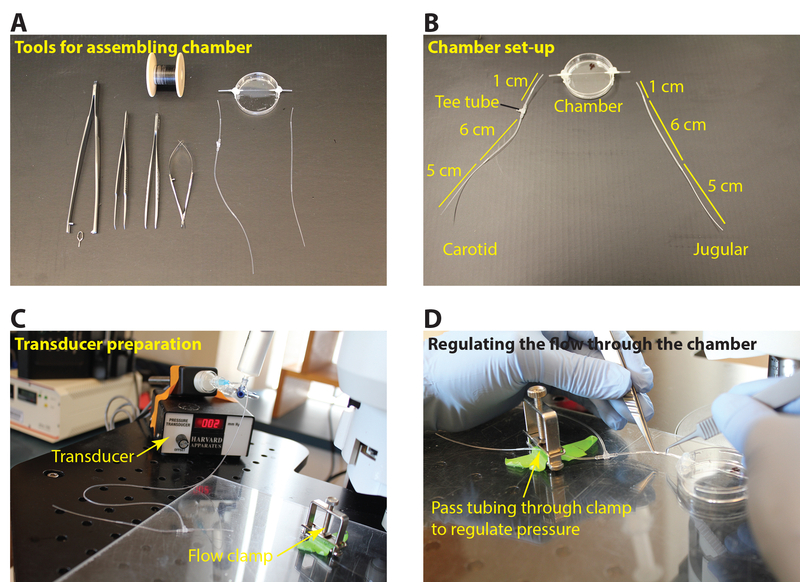 Given the flexibility of coating the chamber with a variety of substances and connecting multiple chambers to the same mouse it will be interesting to see how this procedure is modified for use in other labs in combination with genetically modified mice and disease models. The technique we describe here just touches on a much broader application potential that is only limited by the creativity of the investigator. The authors (L.M., H.S., and K.M.C.) have no competing financial interests to disclose. Research reported in this publication was supported by National Eye Institute of the National Institutes of Health under award numbers: R01EY022084/S1 (KMC), T32EY007145 (HS) and P30EY014104. The content is solely the responsibility of the authors and does not necessarily represent the official views of the National Institutes of Health. Additional support was provided by the Massachusetts Lions Eye Research Fund (K.M.C.) and a Special Scholar Award from Research to Prevent Blindness (to K.M.C.). Barreiro, O., Sanchez-Madrid, F. Molecular basis of leukocyte-endothelium interactions during the inflammatory response. Revista Espanola de Cardiologia. 62, 552-562 (2009). Muller, W. A. Leukocyte-endothelial-cell interactions in leukocyte transmigration and the inflammatory response. Trends in Immunology. 24, 327-334 (2003). Alon, R., Ley, K. Cells on the run: shear-regulated integrin activation in leukocyte rolling and arrest on endothelial cells. Current Opinion in Cell Biology. 20, 525-532 (2008). Mehta, P., Cummings, R. D., McEver, R. P. Affinity and kinetic analysis of P-selectin binding to P-selectin glycoprotein ligand-1. The Journal of Biological Chemistry. 273, 32506-32513 (1998). Nicholson, M. W., Barclay, A. N., Singer, M. S., Rosen, S. D., vander Merwe, P. A. Affinity and kinetic analysis of L-selectin (CD62L) binding to glycosylation-dependent cell-adhesion molecule-1. The Journal of Biological Chemistry. 273, 763-770 (1998). Sandig, M., Negrou, E., Rogers, K. A. Changes in the distribution of LFA-1, catenins, and F-actin during transendothelial migration of monocytes in culture. Journal of Cell Science. 110, (22), 2807-2818 (1997). Shaw, S. K., et al. Coordinated redistribution of leukocyte LFA-1 and endothelial cell ICAM-1 accompany neutrophil transmigration. The Journal of Experimental Medicine. 200, 1571-1580 (2004). Woodfin, A., et al. JAM-A mediates neutrophil transmigration in a stimulus-specific manner in vivo: evidence for sequential roles for JAM-A and PECAM-1 in neutrophil transmigration. Blood. 110, 1848-1856 (2007). Blankenberg, S., Barbaux, S., Tiret, L. Adhesion molecules and atherosclerosis. Atherosclerosis. 170, 191-203 (2003). Parmeggiani, F., et al. Mechanism of inflammation in age-related macular degeneration. Mediators of Inflammation. 2012, 546786 (2012). Ding, X., Patel, M., Chan, C. C. Molecular pathology of age-related macular degeneration. Progress in Retinal and Eye Research. 28, 1-18 (2009). Xu, H., Chen, M., Forrester, J. V. Para-inflammation in the aging retina. Progress in Retinal and Eye Research. 28, 348-368 (2009). Peterson, K., et al. Drug Class Review: Nonsteroidal Antiinflammatory Drugs (NSAIDs): Final Update 4 Report. Drug Class Reviews. Oregon Health & Science University. Portland, OR. (2010). Ulbrich, H., Eriksson, E. E., Lindbom, L. Leukocyte and endothelial cell adhesion molecules as targets for therapeutic interventions in inflammatory disease. Trends in Pharmacological Sciences. 24, 640-647 (2003). Stamper, H. B., Woodruff, J. J. Lymphocyte homing into lymph nodes: in vitro demonstration of the selective affinity of recirculating lymphocytes for high-endothelial venules. The Journal of Experimental Medicine. 144, 828-833 (1976). Abbitt, K. B., Nash, G. B. Characteristics of leucocyte adhesion directly observed in flowing whole blood in vitro. British Journal of Haematology. 112, 55-63 (2001). Smith, M. L., Sperandio, M., Galkina, E. V., Ley, K. Autoperfused mouse flow chamber reveals synergistic neutrophil accumulation through P-selectin and E-selectin. Journal of Leukocyte Biology. 76, 985-993 (2004). Yuan, J., Melder, R. J., Jain, R. K., Munn, L. L. Lateral view flow system for studies of cell adhesion and deformation under flow conditions. BioTechniques. 30, 388-394 (2001). Moalem, G., et al. Autoimmune T cells protect neurons from secondary degeneration after central nervous system axotomy. Nature Medicine. 5, 49-55 (1999). Hafezi-Moghadam, A., Thomas, K. L., Cornelssen, C. A novel mouse-driven ex vivo flow chamber for the study of leukocyte and platelet function. American Journal of Physiology. Cell Physiology. 286, 876-892 (2004). Almulki, L., et al. Surprising up-regulation of P-selectin glycoprotein ligand-1 (PSGL-1) in endotoxin-induced uveitis. FASEB Journal: Official Publication of the Federation of American Societies for Experimental Biology. 23, 929-939 (2009). Schindelin, J., et al. Fiji: an open-source platform for biological-image analysis. Nature Methods. 9, 676-682 (2012). Rapalino, O., et al. Implantation of stimulated homologous macrophages results in partial recovery of paraplegic rats. Nature Medicine. 4, 814-821 (1998). Yoles, E., et al. Protective autoimmunity is a physiological response to CNS trauma. The Journal of Neuroscience : the Official Journal of the Society for Neuroscience. 21, 3740-3748 (2001). Buchanan, M. R., Vazquez, M. J., Gimbrone, M. A. Arachidonic acid metabolism and the adhesion of human polymorphonuclear leukocytes to cultured vascular endothelial cells. Blood. 62, 889-895 (1983). Connor, K. M., et al. Manganese superoxide dismutase enhances the invasive and migratory activity of tumor cells. Cancer Res. 67, 10260-10267 (2007).